Blake 321lb, Sean 295lb today. Both the heaviest each has ever been. Pretty much what we were aiming for this training block with a week to go. Next week Sean will hit some PR's. He PR's his Front squat today ad we'll go for a 350lb clean next Thursday. Blake will PR his front squat and bench. Tomorrow is running however. Some pretty good news for Baylor's Athletic Department. Athletic Scholarships are now fully funded by private donations according to this article. $16.2 million dollars is a heck of a lot of money. I'm frequently turning up pictures of Blake from last year that I haven't seen before. 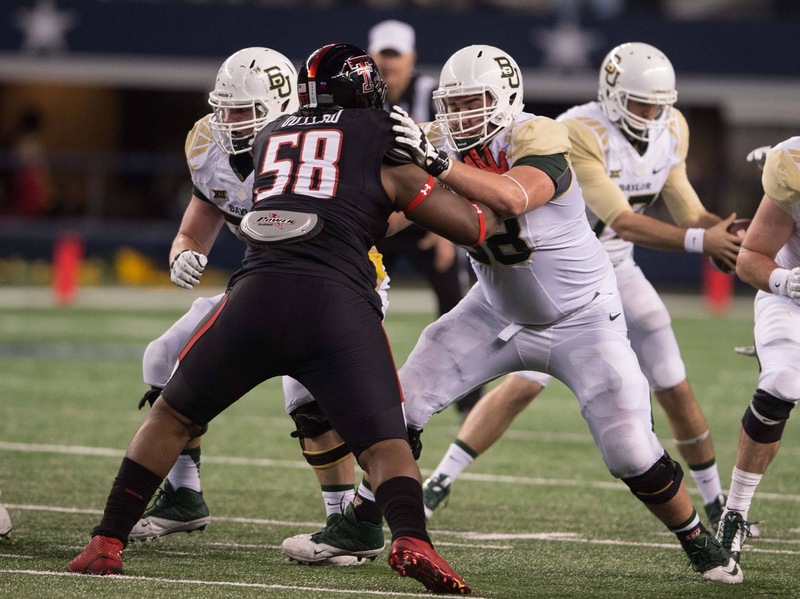 This one courtesy of USA Today with Spencer Drango next to him. Not sure yet is Blake will repeat his distinctive yellow banded elbow of 2014! A nice story in the Waco tribune about a newly finished locker room at the Baylor Athletic department for Baylor's NFL players. Of special note, the funding for thoese sorts of projects is well worth paying attention to. Today's training had a nice PR for Blake. Probably a bit more in it as well. Sean his a PR front squat last week and I'll have some footage of him hitting a few other things next week. As you can imagine, this story is picking up steam and broke in Australian news today. A rumour a few days ago sprung up about Baylor potentially playing a game in Sydney to start the 2016 season. This would be incredible news if true. Well today Baylor Athletic Director Ian McCaw acknowledged on radio that there have been discussions started about Baylor playing an international game. Surely there has to be a lot happen before such a game is announced as confirmed but it could be a great opportunity for Baylor to go global and also come hot off the heels of what could be its best season ever in 2015. For Sean it would also be an incredible experience. Play as a Junior in from of a home crowd........ amazing. The boys don't lift on Wednesdays; instead they run at the track, then back at the gym Thursday and either Friday or Saturday. Judging by this report, maybe we need to get more information out there to analysts so they don't spend half their paragraph talking about another player when describing Blake. You'd also hope that winning the Left Guard job last year when everyone was healthy and being #2 in OL grading on the team would count for a little more than 'played well'. I mean, Blake was 0.1 behind All American Spencer Drango last year at the end of the season. more clips of pics of Blake and Sean lifting this week. Blake hit a 197.5kg Front Squat for a double which was a PR. Sean was doing Jerks from the blocks with 137.5kg for doubles. some clips and pics from this week of Blake and Sean lifting. For an OL, the best time to get in a picture is when someone is trying to get a picture of someone else. 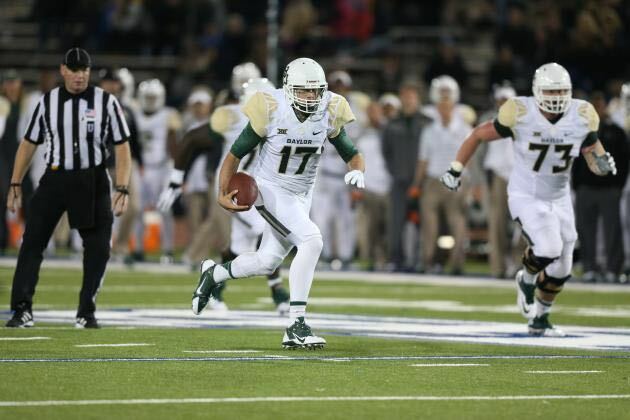 In this case, Baylor QB Seth Russell who made one start in 2014 as well as a lot of back up time. Big things are expected of the Baylor offense in 2015 and Russell will lead the way. 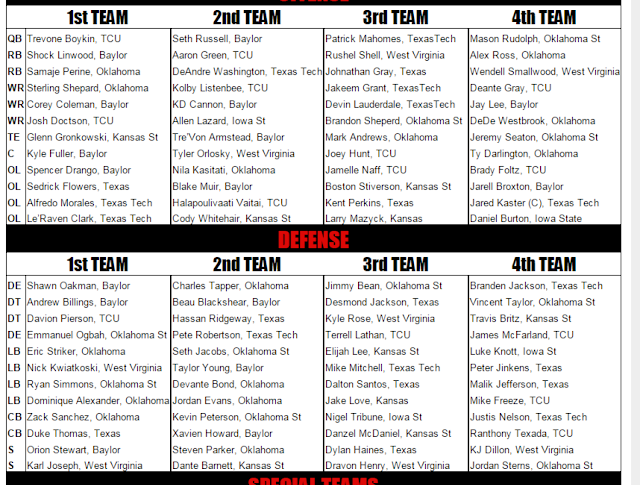 PhilSteele.com has released its preseason All-Conference teams for 2015, Blake was selected to the 2nd team and joins numerous team mates. 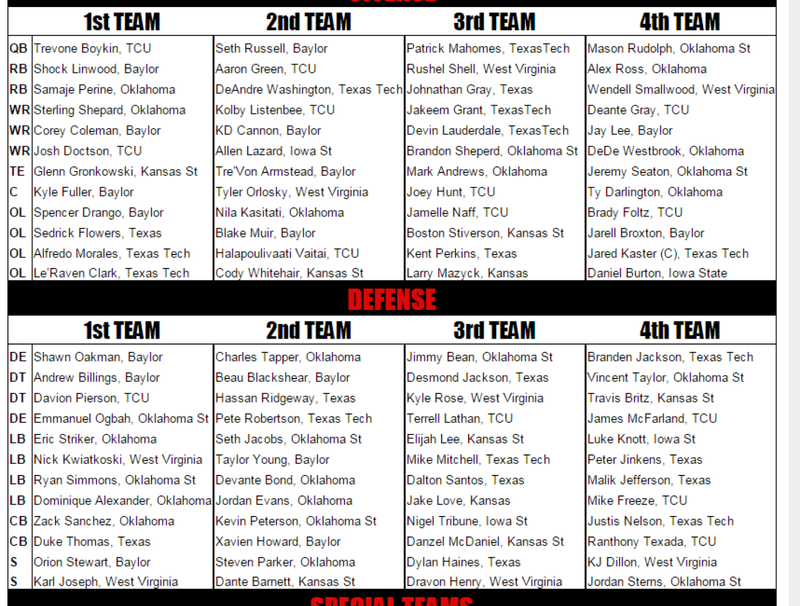 Baylor has the most 1st and 2nd team all conference mentions.